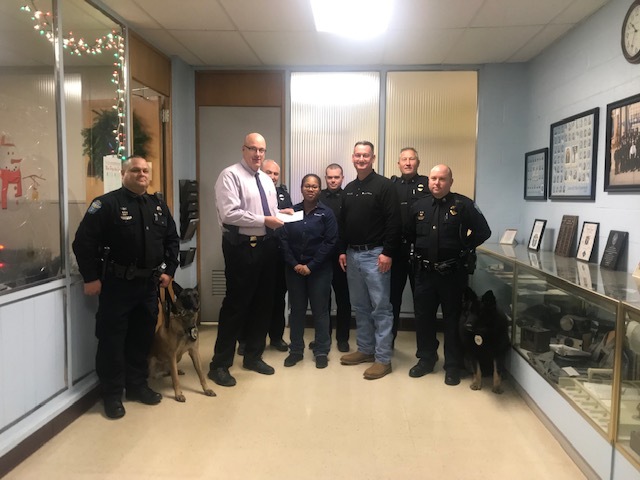 ZANESVILLE, Ohio – Nestle Purina of Zanesville has recently donated to the Zanesville Police Department. They were able to provide a $10,000 check to help the department buy another K9 dog. The Nestle Purina team was made aware recently of just how important the need for K9 dogs in the department is and they wanted to find a way to contribute. This donation will help them train the dog and an officer to handle it and it will make things easier for the officers. Zanesville Police Chief Tony Coury said over the years they have shown that the K9 units are a very important asset. “These dogs are everything to us and for these handlers and for this department. We’re able to detect illegal narcotics along with apprehensions and now we’ll be able to put another dog. So we’ll have all of our shifts covered and the accessibility of another dog anytime we need it when there isn’t one here,” Coury said. This will not only help the department but it will also help the community. Driggs said that they are proud to help and all that they ask is for people donate to their local shelter.